Discussion in 'Linux Editor' started by Kurolox, Jun 28, 2018. I've been trying to get Intellisense to work, but I don't get any relevant autocompletion like other people I've seen here. Not sure what could be happening. The C# extension is installed, and mono too. I've followed the steps indicated here too: https://code.visualstudio.com/docs/other/unity but I can't get it to work properly. I hope anyone here could have a lead regarding what I'm missing. I've found that the issue might be that Unity isn't generating .sln files, which VSCode seem to need in order for the imports to work. Any idea about why those files aren't being generated? Your dead on with the issue being Unity not creating the .sln files. I've been having the exact same issue as well since updating Unity. I've found a workaround to generate the .sln files. If you selected the correct executable, there shouldn't be any External Script Editor Args field. 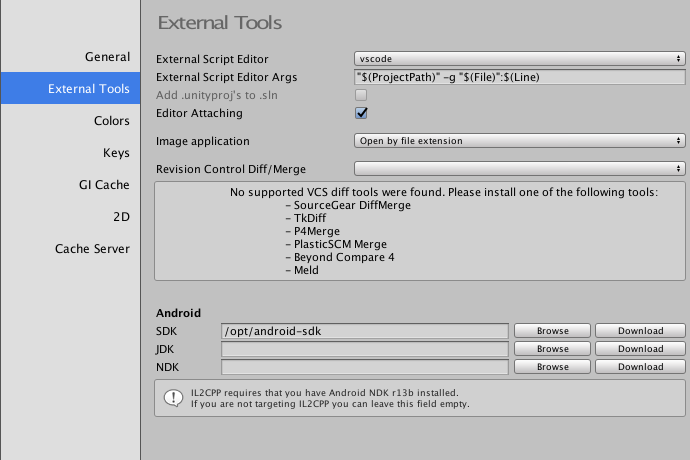 if you try to open any script from unity now, it will still won't work. Code files won't be generated, and only the script will be opened in code, instead of the folder. Don't worry. Go to Assets -> Open C# Project. 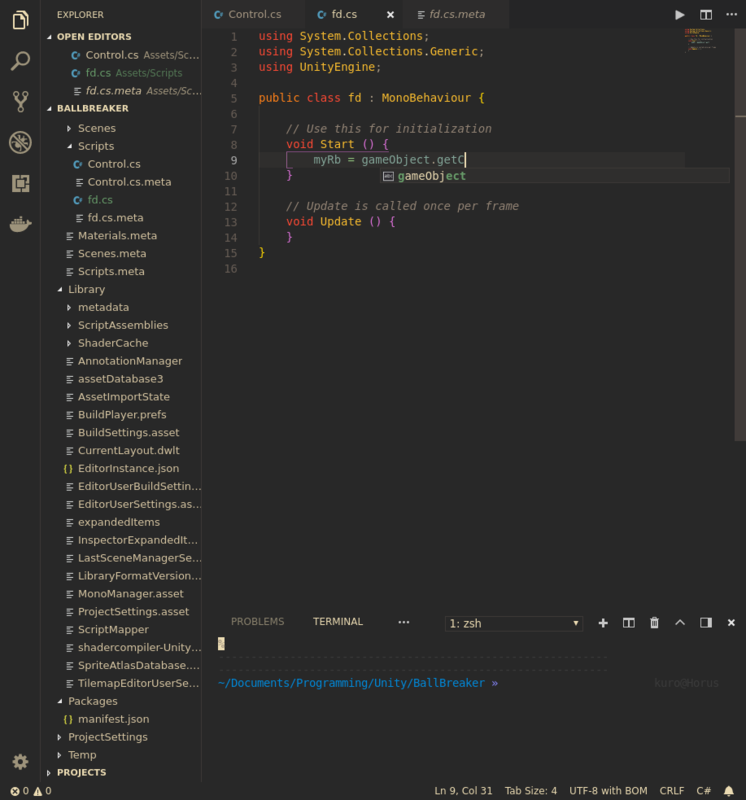 Now code will open the project folder, the .stl files and other meaningful files will be generated (like the .vscode folder), and Intellisense will work properly. Let me know if it works for you too. unity_aTwq4Yux6lZwGw and NotSoAI like this. I think this is a bug with Unity 2018.2 (at least, that is when my troubles started) .. As you already pointed out, Unity no longer creates the .sln file. In my project, the .sln file is there but is no longer updated. This issue is that Unity Editor expects the file used to launch VSCode to have a specific name. It seems that unity will only trigger the .sln/.csproj generation routine if the filename matches a hard-coded value. Specifically, creating a symlink named "code" that opens VSCode fixed this issue for me. The normal binary was named "visual-studio-code", which Unity didn't recognize as VSCode. Unity devs may want to consider a more sophisticated method of determining whether the selected external editor is VSCode, VS, etc. Thank you guys for the workaround, I was using VSCode Insiders which has a different executable name and wouldn't make Unity generate project files. Please upvote that suggestion so that we can have a decent behaviour with any code editor! Then followed your steps and got it working. I don't have any External Script Editor field. Am I doing something wrong? M4RCIN and jacobgmartin like this. I think the problem on my machine was two versions of VSCode fighting for Unity's love.